Model based analysis is a method of analysis that uses modeling to perform the analysis and capture and communicate the results. For social problems the two main forms of modeling used are causal loop diagrams and simulation modeling. Causal loop diagrams are used for preliminary conceptual attacks on the problem. This gives way to simulation models for the rest of the work. Thwink.org has selected system dynamics as the most appropriate simulation modeling tool, due to its simplicity, power, and emphasis on feedback loops. Model based analysis is the third of the three main tools in our toolkit for solving difficult social problems. 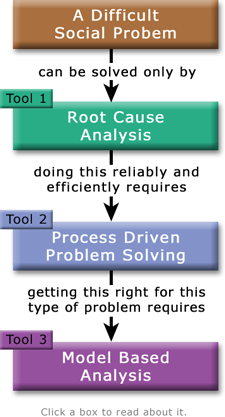 The process used, the System Improvement Process, requires model based analysis to execute the process. The process uses a series of steps to ask questions, such as What are the feedback loops that are currently dominant and causing problem symptoms? 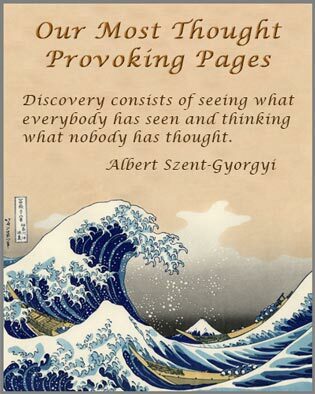 A model is built to answer the questions. The three main tools diagram explains why the three tools are required. Difficult social problems like sustainability are so difficult they require all three tools to solve. That these tools have not been applied to the sustainability problem as a whole explains why past solutions have failed. The carpenter has been using the wrong tools for the job. In 1903 the Wright brothers were the first to make a sustained, controlled flight with a heavier-than-air motorized aircraft with a pilot aboard. Many had tried before and failed because unlike the Wright brothers, they did not use a sufficient amount of model based analysis. 1. In 1899 a five foot long box kite allowed testing wing warping as a way to achieve flight control. Strings attached to the kite could twist its wings. The model showed that wing warping could cause controlled banking to the left or right. 2. In 1900 a full sized glider was used as a kite to further test wing warping and lift. This was done at Kitty Hawk to take advantage of the area's strong breezes. Some flights were made as a true glider with Wilbur aboard. "The brothers were encouraged because the craft's front elevator worked well and they had no accidents." 3. In 1901 they built a miniature airfoil and tested it by mounting it in front of a bicycle. Model testing showed that published data on lift was unreliable, so the Wright brothers begin developing their own data, later perfected in the wind tunnel. 4. Realizing that full sized glider models were expensive and time consuming, they build a six foot wind tunnel and began systematically testing different miniature wing designs. The data and conclusions improved lift, the lift-to-drag ratio, and control in their 1902 full size glider model. 5. In 1902 they designed a new full sized glider and tested it. Improvements were made. The vertical rudder was made movable to improve control. A long series of model tests, between 700 and 1,000 glides, were made. All the problems of lift and steering were worked out using roll, pitch, and yaw controls. Their final conclusion was they were now ready to try a machine powered flying aeroplane. 6. In early 1903 further wind tunnel testing was done on propeller models. The data was used to design the critical part of machine powered flight: the propeller. Two eight foot propellers were built, one for each side, rotating in opposite directions to prevent torque. Model based analysis had now solved all their major subproblems. 7. No lightweight motors were available, so Charlie Taylor, their shop mechanic, built one in six weeks. The first Flyer was assembled. It weighed only 605 pounds. On December 17, 1903 four successful flights into a 27 mile per hour headwind were made. The final flight traveled 852 feet in 59 seconds. The problem of human aviation was at last solved. The Wright brother's use of model based analysis allowed them to penetrate the superficial layer of the problem and work on fundamental layer. (1)	The information about the Wright brothers is from this Wikipedia entry. (2) The two quotes at the end are from this article. A. Find the immediate cause of the problem symptoms in terms of the system's dominant feedback loops. B. Find the root cause of why those loops are dominant. C. Find the intermediate causes, low leverage points, and symptomatic solutions. 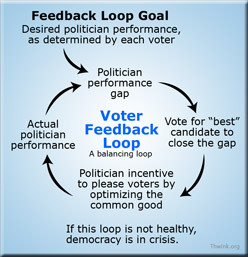 D. Find the feedback loops that should be dominant to resolve the root causes. E. Find the high leverage points to make those loops go dominant. Modeling is required to find the feedback loops in substeps A and D. It's also required to find the low and high leverage points in substeps C and E, since a leverage point is a place on a system's structure where a solution element can be applied. 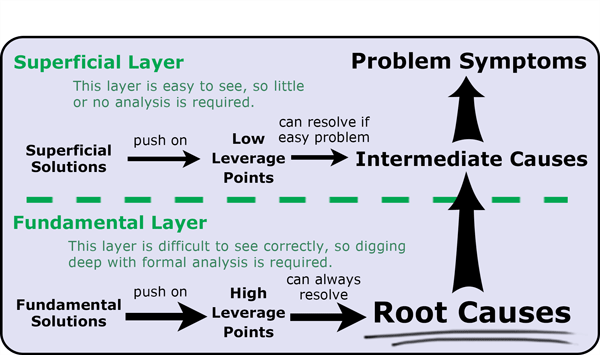 Most important of all, modeling is required to find the root causes in substep B. Thus model driven analysis is essential, not just for solving the How to Fly an Airplane Problem without killing yourself, but for solving the How to Fly Spaceship Earth Problem sustainably.